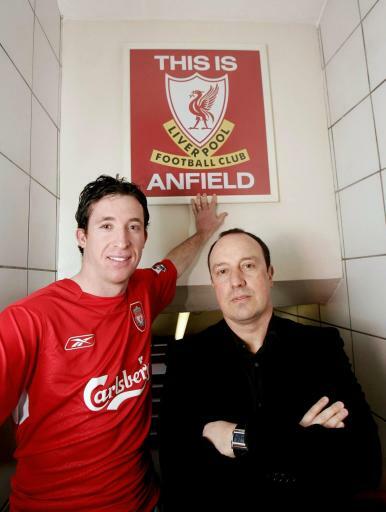 Robbie Fowler - The best natural goalscorer - LFChistory - Stats galore for Liverpool FC! It was safe to say a dream come true for me to interview a man, who is, in my opinion and probably many others, the greatest-ever natural goalscorer to have played for Liverpool Football Club. I first bumped into Robbie Fowler in 1998 outside Anfield. For the only time in my life I became utterly star-struck and as I approached him to ask for a picture with him my brain just froze up and I spoke utter nonsense. Robbie just stared like there was something seriously wrong with me. I gathered my senses, did better in my second attempt and got the picture. I have come across him on a couple of occasions at Melwood since then, but now 16 years later I was one of the lucky ones who had the absolute pleasure of being in his company for the better part of a weekend. Robbie was an absolute delight and proved to be still a cheeky, little bugger as my mate found out who made the error of losing his concentration for a split second. Fowler threw a snowball that landed straight in his face. No remorse from the great man, and maybe, to Robbie's disappointment, no retribution. My mate is kind of proud really to have been hit in the face by God himself. You were as you described yourself, a cheeky, little kid from an inner-city council estate in Toxteth who got thrown into the stratosphere of the Premier League. When I said ‘cheeky, little kid’ I don’t mean it in a bad way. I just mean a little bit mischievous and I think probably most Scouse little kids are the same. I think it’s just being a little bit ‘wary of the world’. I was never a handful … I think that’s just growing up in Liverpool. You’ve got be a tough kid to grow up where you are and I was not brought into this world with a silver spoon in my mouth and I think that’s probably why I appreciate a lot of things now and meeting a lot of people. I still enjoy that. It touches the upbringing I have had. My mum and dad were never together so I lived with my mum but I was very close to my dad so I think I was just brought up the correct way by both of them. You credit Bobby, your dad, with helping you and getting you new boots? I didn’t lack anything. You are always grateful for your mum and dad and particularly my dad. He was probably at every game and he got me my first pair of boots and you can say, 'So he should, he’s your dad,' but we didn’t have a load of money and he worked hard. My mum worked doubly hard to get me everything I needed and it’s stuff that you’re always grateful for. That is not a big thing to be honest. My mum’s name is Ryder and 'cos I had a sister in school who was already called Ryder. It would have looked odd if we had different names so I went into school as Ryder and it just sort of stuck. When I got old enough when I went to a different school I had my name changed back to Fowler. The name on my birth certificate is "Robert Fowler" so other than that there was no other reason. "It wasn't just the goals. He knew when and where to put the ball away, and run into space. He had such a lovely touch on the ball." score three goals in a match for Liverpool schoolboys. Of course it’s a well-known fact that you were a Blue. Jim Aspinall’s tenacity brought you over to Liverpool? I think you’re always grateful for getting spotted. I did grow up an Everton fan and Jim knew this and he just thought, 'Listen, I’ll chance it and if he comes to Liverpool, then great.' I did have chances to go to Everton as a youngster as well but I’ve always been quite loyal 'cos Jim was adamant that, 'Oh well, we’ll try and get him to Liverpool.' He was always coming to see me at the house and he was always coming to the game so he was very … persuasive is not probably the word … … but he was very… in fact, probably persuasive IS the word actually... getting me to sign for Liverpool and I was so grateful. I was never one of these bad Evertonians where I didn’t like Liverpool. I appreciated good football, the upbringing I had; I loved football and I always knew Liverpool were a great team anyways. Being brought up in Liverpool most families are Everton and Liverpool. My family is still the same. I’ve got many, many Everton fans and I've got many, many Liverpool fans. Well, my dad’s the biggest convert. He was an Everton fan who, like me, can’t stand them any more! There’s a similarity with you and Gerrard that you were considered too small and lightweight to get into Lilleshall. Today is a different you have players like Xavi, who are small in stature, but still appreciated... Why couldn't they see your talent despite your height? It’s easy to say we never got in because we were too small but at the time we just might not have been good enough. It’s as simple as that. That might have been an excuse that people were using but really it’s not something I’ve thought about too much. Maybe we weren’t good enough when we were a little bit younger. Maybe there were better players out there at that time? So it doesn’t bother me that people think, 'Oh, you never got into Lilleshall or wherever because you were too small.' The important thing is that myself and especially Steven, we have gone on to have fantastic careers and playing for clubs that … alright, Steven was a big Red anyway so he’s gone on to play for the club he’s always loved and I was lucky enough to grow to love. So we were lucky that way. I understand what people were saying in terms of, 'He’ll struggle with his size,' but it didn’t bother me. I was never interested. I always knew and I was always confident of being a good player anyway. Again, I think you’re spot on. It doesn’t really matter, does it afterwards? When you’re playing with the adults it’s important that you stand out and again especially Steven’s gone on to be one of the world’s greatest players. So anyone who reads this will tell you that, 'Size isn’t everything.' Some wives might disagree, but that’s obviously an opinion of mine and many others. Were you always a goalscorer from the very beginning? Yeah, I was actually. I never ever as a kid said I wanted to play up front. When you’re a kid you’ll play anywhere and you’ll try and score goals and you’ll try and defend. That’s what I did. And all of a sudden I was getting put in teams because I was quite skillful as a young kid and scoring goals. People just automatically put me up front but I never ever once said, 'I’m gonna be a striker.' I just wanted to be a player. It just sort of fell into place that I was not a bad goalscorer. I remember the first time I saw you play was for the England Under-18s in the Euros. The goals you scored were incredible. Was it the first time you were recognised by people outside of the club? It was funny that tournament. I never started off that tournament. I was a substitute and came on. And I never actually played up front. I played in the hole behind the strikers. There was two strikers and we played like a 4-4-2 but it was a 4-diamond-2 and I was the front of the diamond so I was like the attacking midfielder. So I always think I’ve been able to play there but the fact is, because I’ve got a good goalscoring record that side of my game people don’t really talk about much. I went back to Liverpool after that tournament and I was still young and I became a regular in the reserves and I hadn’t done that before. So it was a good starting point for me, that tournament and it probably opened a lot of people’s eyes up. You scored a few goals past Aston Villa's keeper, Mark Bosnich. He said that you seemed to get a late fade on your shots like a golfer and usually get ten out of ten shots on target, and with nine out of ten you hit the corners. Can you explain that accuracy or does it just come naturally? Explain... this puzzles me to be fair. People think you just turn up on a pitch and things happen. I was forever practicing. And the more you practice the better you get. People don’t see the side of … not just me but any footballer. They do a lot of hours beforehand and the practice that they do is just unbelievable and I was the same. From an early age I was forever just carrying footballs around and doing stuff, aiming for targets. A bit of advice to give kids now, you don’t need a goalkeeper when you’re shooting at goal. I used to get little targets and put them in the corners of the net and just aim for them. You see some of the players now and they’re hitting the ball as hard as they can 'cos the keeper won’t save it. Keepers now are quite reactionary. If you’re smashing a ball, 5-6 times out of ten the keeper will save it. But if you hit a ball hard and low or hard and high into the corner then it’s doubly more difficult for a keeper to try and save it. Of course, I, the interviewee, had to have a photo of myself with Robbie. I have to reiterate that... no, I am not a professional model. You are one of five players who have scored five goals in a single game for the club. You didn't make a fuss about your accomplishment and said that you went to the chippy with your mates and got a big kiss from your mum. It must be pointed out that Andy McGuigan, who became the first Liverpool player to achieve this in the league, had an easier task as the game went on Stoke had only seven left on the field because their players had gotten food poisoning after eating rotten fish. Oh, you’ll know! You’ll know!... As you can probably tell, it is well documented that I love Chinese food. Straight after the game... I was only a young lad and I was never ever gonna go to nightclubs and do all the stuff that people think at that particular age. I would go home, go the chippy and I had to be on the treadmill the next day and I was still driving around in a little crappy car. I was very, very grounded and that just goes back to your parents and the way you were brought up. Ronnie Moran told you in the changing room after the Fulham match that you could have still improved on your five-goal performance and had no reason to look "so smug." That’s true. You think of Ronnie Moran and some of the players he’s had experience of working alongside. I mean I was absolutely delighted but it’s not until you’re a little bit older that you appreciate things like that and you know how much Liverpool means to a lot of people. But Ronnie Moran was brilliant. He was always about the club, keeping the players’ feet on the ground and you know what? It’s spot-on. I think it’s so, so true. Players can’t afford to get big-headed now. It’s gonna have an adverse affect on not just yourself but the club as a whole. So it is all about keeping your feet on the ground. Going in after a game and scoring five goals and I think, 'I’ve cracked it. I’m a footballer now.' But Ronnie Moran just stopped me dead in my tracks and said, 'Hey, you should have had six, you spotty little... something!' Obviously he had spotted a little something but it’s what they do at Liverpool. They’ve always been like that and I hope they continue to be like that for many, many years. Is there a "Liverpool Way" of coaching and motivating? There’s different types and different ways of coaching people. But Liverpool has always been about the club. Players will come and go and we’ve seen that over the years. We’ve had some fantastic players when you think back … Kenny... Rushie goes and I come in and do alright, I leave and people think, 'Oh, you can’t replace these players,' but we can, we always can. The club replaces players but the club will always remain. So it’s important that you treat it well and everyone’s gotta take to the club first more than anything. It’s not about individual and selfish pleasures, it’s about the club as a whole and that’s what Liverpool has got from Academy level to the first-team level. You just pointed out that the club should come first, but I was thinking about your legacy at the club. Rushie said you would break all his records... shatter them. Obviously you had a brilliant career...don't get me wrong... but you got some bad injuries... do you look at it and wonder what could have been. Are you satisfied with your Liverpool career as a whole? My career’s been very good. I would never, ever swap it. I’ve been lucky enough to play for in my eyes THE best club in the world so I don’t think anyone can get bad ideas or bad vibes from that. You would have liked to have played more games, scored more goals and finish your career there. But life isn’t always perfect. You’ve gotta play the cards you’re dealt with and I wouldn’t swap anything. Everything happens for a reason. I would have loved to have scored many more goals but it didn’t happen. Your return to Liverpool. How did it come about? I wasn’t even playing for Man City. So I would go home on a Saturday and I would watch all the football scores coming in. I was still a Liverpool fan and so I was always wanting Liverpool to win games. They were struggling maybe for a goalscorer and that sounds silly because we had good players there who probably weren’t scoring as many goals as we would have liked. In a way I was delighted because it gave me this chance to come back. And how it came about was I was playing golf. I had just started on the golf course. I had my bag down and I was just about to tee off. And I got a phone call from Rafa, 'Would I be interested in coming back to Liverpool,' and you know what the answer was. I went straight to Anfield and went to Rafa's and Rick Parry's office. They just said, 'Well, if you sign this contract you’ll be a Liverpool player.' I left Liverpool and I’m glad I left because it got me to appreciate somehow how good a club and how special it was. But getting the chance to go back to Liverpool was … well it’s hard to put into words, it’s an experience that will live with me forever and in particular the first game against Birmingham when I came on as sub. You can’t write about that. That is just etched in my memory forever and ever. I’ll always be grateful for the support I had but going back was just unreal. How was the rest of your round of golf? Oh no, I couldn’t play. I didn’t play. There was no chance I could have played golf. I would either have finished these eighteen holes of golf and don’t sign for Liverpool or leave the golf clubs and sign for Liverpool. So I literally just left. I didn’t even tee off. I just left and just went straight to Anfield. "It was all done within 24 hours. I had to persuade Robbie to look at the contract. I think I could have put a contract in front of him with no money on it and he'd have signed it!" Rick Parry said that you almost didn’t look at the contract. No. I never. I’ll be honest. I never looked at the contract. I think because it was only like a six-month contract. And I didn’t even have a medical. I remember asking Rick 'cos I was so excited, 'Where do I go for my medical?' because I was delighted and Rick said, 'You’re only here for a short time, obviously with the option of staying a little bit longer.' And I didn’t even have the medical. I just signed the contract. I didn’t know what was in the contract. I was back where I loved being. Back where it all started. You talked in your autobiography about the glitz and glamour of the Premier League and everyone wants a piece of you and it was a bit much to take in? I was quite shy and I wasn’t prepared and ready for what came with football. You’re a role model without wanting to be a role model. You play football because you love playing football. I didn’t understand what came with it. And the fact that I was shy didn’t really help me as well because I wanted to be myself and all of a sudden all eyes are on you. It never changed my game and never changed me as a person. Some people are very, very comfortable in their own skin and at the time I wasn’t ready for it. Do you ever get used to it or are you still a bit shy? I've seen for myself the commotion you create when people spot you. You are probably the most popular ex-Liverpool player. As a player it’s nice to be liked and it’s nice to be loved and it’s nice to be appreciated. But there comes a time where you do need a little bit of space and it’s not being egotistical, it’s not being big-headed, it’s not being awkward, it’s just being normal. You wanna be treated as normal as the next person then all of a sudden you’re backing into a corner and you can’t really be yourself because you’re... "Intimidated" is probably the right word because it’s a little bit false. Listen, don’t get me wrong. It’s not always like that. You had this sinus problem and brought the nasal strip to the fore. Did it ever work? Did it become a superstition with you? No. because I was never, ever superstitious. I said before, 'Everything in Life is about opinions.' I tried this nasal strip. I tried it in training and I felt the benefit of it. What it did, it just opened the nostrils and let more air into your lungs and into your body. And it worked for me. What works for me might not work for other players. I was not getting paid for it. It was not a sponsorship thing. I never done it 'cos it looked good. Frankly, it looked embarrassing, didn’t it? Your relationship with Roy Evans was very good and you have said if he had been given time he could have achieved a lot more as manager of Liverpool. I've played under some unbelievable managers. Roy Evans would be the first to admit he is not as technically or tactically sound as Gérard Houllier and Rafa Benitez, but as a man-manager he was brilliant. If you look at some of the comments that Steven’s doing lately about Brendan Rodgers... his man-management is there, he speaks to the players … and it’s echoing to me; Roy Evans. To get the best out of players you’ve got to man-manage them very well. I think 60-70% of being a great manager is being a very, very good man-manager and Roy Evans was brilliant at it and now Brendan Rodgers is exactly the same. We were never a million miles away under Roy Evans but we were one or two players short. Roy Evans gave you that little bit of belief, you went out on the pitch and you could believe in yourself because of the way he spoke to you. And it’s the same with Brendan Rodgers now. "When Gérard Houllier and Roy Evans were joint managers we went every year to Norway. We’d played this Norwegian team, after the game we go upstairs, get changed and all come down the lift in our jeans, shirts and jackets. Gérard Houllier is by the front door and he says: 'Where are you all going?' 'We always go out for a drink.’ 'Not tonight,' he said. Next minute there was a "Bing!" The lift opened and it was Roy Evans in his suit. ‘We’re with him,’ and we go out." When Liverpool are THE biggest club in the world in my eyes and many, many people’s eyes it just seemed a little bit strange that we were having joint-managers when we didn’t really need them at the time. I’m not having a go at Gérard Houllier but at the time we were doing alright under Roy Evans and maybe given a little bit of time things might have been different but the club felt it their way to bring Gérard in and go down a different avenue. It was weird and awkward because you’ve got one manager telling you one thing and one manager telling you different things. So they had different ideas. It never worked and you can understand why, both different characters, different types of manager, and someone’s got to make the decision. So we were a bit perplexed and puzzled about who to go and see and what to do but it is what it is and the club eventually got rid of Roy and Gérard came in. Do you think though that Houllier resented you in a way because of your perceived laid-back attitude towards diet and possibly training? I disagree with that because my attitude was right. I was never … No, I understand what you mean but I worked on stuff, I trained well, but in terms of diet and all that... I came from the old school where players ate steak and chips as a pre-match meal and some people find it hard to sort of make that adjustment. I never found it hard but when you’re comfortable doing stuff then it’s hard to break away from the norm and do other stuff. It’s proven that it’s effective looking after your body but I never, ever once thought I’m doing this because I want to be awkward. You do stuff because you’re comfortable. I remember Ian Rush used to have steak and chips on a Saturday afternoon at half-twelve. Following your injuries in the 1997/1998 and 1999/2000 seasons do you think you were trying too hard to please Houllier to get more playing time and that it curtailed your natural ability... because you’re trying different things and maybe not the things that you were used to, messing your mind up? I don’t know … (pauses) … I know what the question is you’re asking but I don’t know how to answer it. Because I was always … no matter where I’ve been and where I’ve played, I’ve always done well and I’ve always scored goals and that was always the case with Liverpool. I was never, ever once on a horrendous run where I never, ever scored for ages. You have bad periods when you don’t score but, eventually I was always confident that I could do well. People think that we hated each other but we never... I mean I just spoke about Roy Evans there, about how good a manager he was. 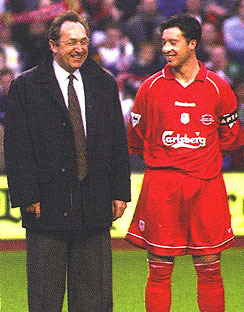 I fell out with him many, many times 'cos I never played and I fell out with Gérard Houllier. I fell out with Rafa and I loved Rafa for giving me the opportunity to come back to Liverpool when I thought it had well and truly gone. I’m one of those players, 'I wanna play and if I’m not playing I’m not happy.' And I don’t think that’s a bad thing. Your manager can’t play everyone and sometimes I’d go in and ask him why I weren’t playing. If the manager tells you I’m not playing you because of this... you can go and maybe change on the training pitch what you need to do. So it’s a case of wanting to play and also finding out what I need to do to play. I don’t know if it was because I was a Liverpool lad, going back to the little bit of mischievousness and a little bit of cheekiness. Interview by Arnie ([email protected]) - Thanks to Grétar Magnússon and Lee McPartland for their assistance and Chris Wood for transcribing the interview. The first four images are owned by LFChistory.net and not to be published anywhere else without prior consent.